Accent Your Body is the comfortable, safe and virtually pain-free way to tone and tighten your skin, without liposuction, injections or prolonged recovery time. Skin firming in Tampa & St. Petersburg using Accent reduces skin on the neck, eyelids and cellulite on your body with a less expensive alternative to invasive surgical procedures. You will experience firmer skin on neck, face, abdomen, thighs and arms. It also firms the skin where previous surgery may have left dimples. 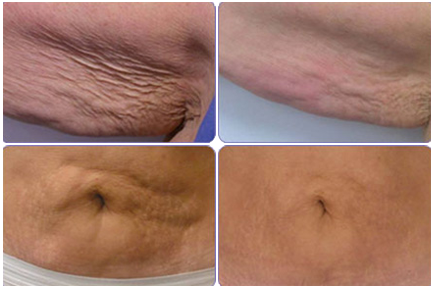 Accent Radiofrequency laser therapy is the treatment of choice to tone and tighten skin, reduce stretch marks, and skin laxity anywhere on the body or face. During treatment, your technician will heat an area of the inner layer of your skin using radio frequency technology. As the skin is heated, a natural reaction occurs that promotes the creation of new collagen. The result: a return to smooth, elastic skin of youth. Come in for Your Lunchtime Lift! You can return to your daily routine immediately! Show off the new you in firm and tightened skin! Please call (813) 902-9559 or (727) 278-3992 to schedule with Dr. Hermann.